The New PCOMS Manual Is Here! It has been sixteen years since the original Heroic Clients, Heroic Agencies: Partners for Change was published. What began as a simple way to privilege client voice and encourage therapists to talk about outcome and the alliance with clients has evolved to an evidence based practice of using the Outcome Rating Scale (ORS) and the Session Rating Scale (SRS) called the Partners for Change Outcome Management System (PCOMS)—a systematic way to both operationalize the values of client privilege and dramatically increase the number of clients who benefit from services. Six randomized controlled trials, three benchmarking studies in public behavioral health, and a cohort study have unequivocally shown that PCOMS delivers with youth and adults, in individual, couple, and group therapy, with both mental health and substance abuse problems, and with the impoverished and disenfranchised. These studies bring top tier journal credibility to not only the measures but also to the whole transparent, collaborative process we call PCOMS, and of course, enabled PCOMS to be recognized as an evidence based practice by the SAMHSA. Building on the three editions of Heroic Clients, Heroic Agenciesand almost twenty years of teaching and implementing PCOMS, Drs. Duncan and Sparks break down PCOMS into 10 learning modules addressing the 10 skills of PCOMS as well as individual chapters on couples, families, groups (thanks to George Braucht), and case management and child protection services (thanks to Robyn Pope). The Manual also provides modules on the four steps of PCOMS supervision as well as the secrets of implementation. Other features include fast access to summaries of the psychometrics of the PCOMS measures, the rationales for PCOMS, and all the handouts that aid in implementation in one convenient place. 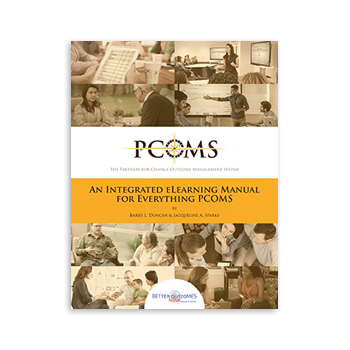 Written in an accessible workbook style for service and treatment providers of all stripes and flavors, the PCOMS Manual is integrated with Better Outcomes Now and the PCOMS eLearning compendiumof webinars and client videos, providing a full curriculum for orientation of new employees and ongoing PCOMS training. The PCOMS Manual reflects the expansion of PCOMS to apply to persons in any service who experience emotional, psychological, social, or behavioral distress. With a recognition of the many forms this work takes beyond the office couch cliché, PCOMS emerges as applicable for any service that seeks to build strong relationships with clients, is interested in the consumer’s perspective of benefit, and that desires to actualize social justice beyond lip service. This manual incorporates all the developments in conceptualization, research, practice, and training of the past eight years. It consolidates the Heroic Clients, Heroic Agencies and Outcome Rating Scale/Session Rating Scale Administration, Scoring, and Interpretation Manuals into a complete PCOMS Manual encompassing everything you need to know in an easy to read format. Barry and Jacqueline consider it a living document given it is self-published. Consequently, please feel free to offer feedback about your experience of using this manual. Check out the Table of Contents and a sample chapter. Duncan, B.L., & Sparks, J.A. (2018). The Partners for Change Outcome Management System: An Integrated eLearning Manual for Everything PCOMS. Jensen Beach, FL: Better Outcomes Now. Many exciting projects, implementations, and innovations continue. Stay tuned to the Better Outcomes Now Facebook page for the latest.